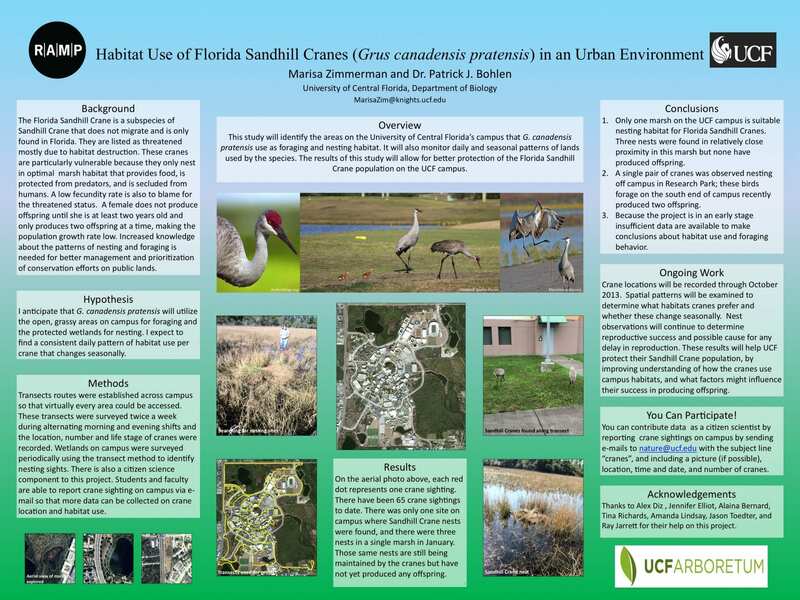 This project identified the areas on the UCF campus where Sandhill Cranes forage and nest. Monitoring was done daily and seasonal patterns of land use by the species was recorded. The results of the study allow for better protection of the Florida Sandhill Crane population on the UCF campus. During the Spring 2013 semester, undergraduate student interns wrote land management plans for UCF’s McKay Tract and for the Student Union cypress dome. These management plans provide long term management strategies that are specific to the parcels’ ecosystem type. Interns spent the semester studying their area of management, researching historical management of these types of systems, and producing a management plan that will be put into motion by LNR. The threatened and protected gopher tortoise is a burrowing species that calls the scrubby habitat on campus its home. The tortoise is not the only animal that benefits from the burrows they dig. Over 360 other species, some of them threatened or endangered, use gopher tortoise burrows as a place to live or as protection from weather and fire when it sparks. Without this species of tortoise, many others would disappear as well. Since this keystone species is so crucial, we find it important to inventory the number of gopher tortoises living in campus habitats. LNR has had student interns conduct gopher tortoise surveys 3 years in a row to define a census of tortoises living in our scrub habitat. This project gives students real world experience in the field and is a positive addition to any biologist’s resume. Student interns have begun to research the urban forest, and its potential in sequestering atmospheric carbon, through a research strategy called Urban Forestry Effects (UFORE). The UFORE study attempts to set the baseline carbon sequestration rate for all of campus by measuring the structure of the campus’s urban and natural forests. This information is collected by student interns and will be used in the policies and master planning processes for the future land uses on campus. This information can also be used to determine the hourly pollution removal rate and the cooling effect trees have on nearby buildings. A green roof is a roof that is either partially or completely covered with plants. There are two types of green roofs – intensive and extensive. An intensive green roof requires more maintenance, thus it has deeper soil and can support plants, and even trees, with larger root systems. A roof garden would be an example of an intensive green roof. Extensive green roofs, like the ones on campus, have small shrubs and grasses with smaller root systems and require less maintenance. An Urban Heat Island (UHI) describes a developed area that is hotter than surrounding, less developed areas. UCF experiences an urban heat island effect, but reduces it by preservation of green space on campus and installation of planted materials near, and sometime on top of, buildings.